These easy, three-ingredient pumpkin peanut butter dog treats are pup-approved and perfect for fall! It’s time that you all meet Lily. Our little fur baby is the sweetest part of the Howard family. We adopted her just over a year ago from a local animal shelter, but it feels like she’s been a part of our family for much, much longer. We had been dogless for about 6 months and knew it was time to find a new family member. We searched PetFinder for adoptable dogs and scoured Facebook for all of the local adoption events. Our shelter had a photo up of an adorable beagle, so my husband scoped out the shelter after work one day to meet him. We went back on Saturday to meet this dog together, but when we arrived he had already found a new family. Then we saw Lily – a beautiful, energetic, loving dog that looked so lonely in her kennel. We took her for a walk, played some fetch, and were instantly in love. We signed the papers and took her home that morning. 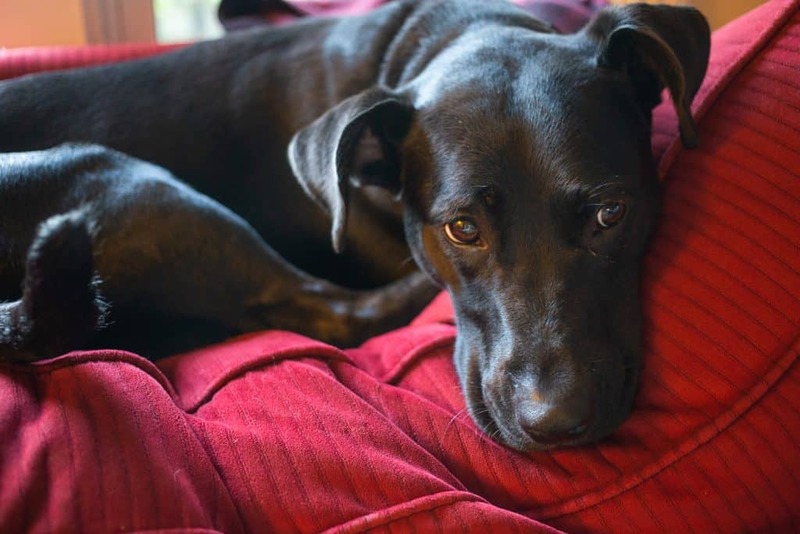 She responded so well to her shelter-given name, so she’s been Lily ever since. 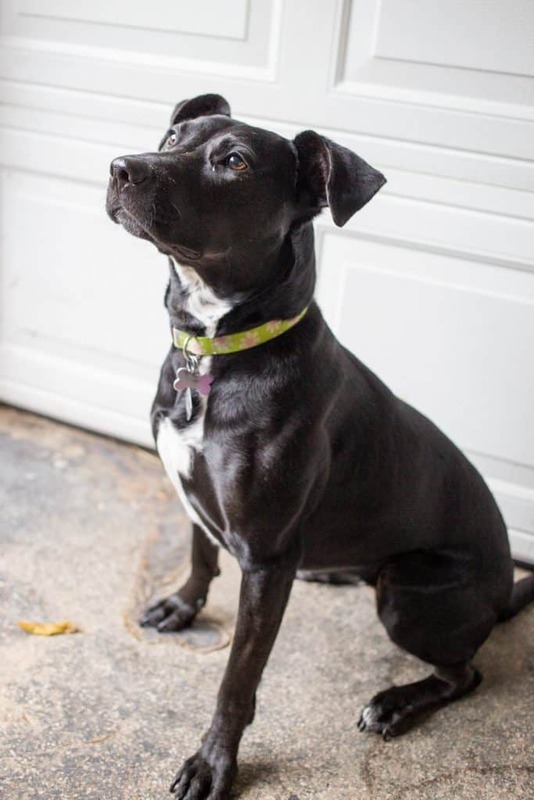 What we know about Lily: Lily’s about four years old but has the energy of a puppy. She has the softest fur, loves to cuddle, and loves attention from any human. She chews hard on her Kong or gently on her soft, squeaky toys and has never chewed on anything that was not a dog toy. She loves to play fetch and zoom around our yard. She dreams about squirrels and tries to jump our 6-foot fence to get to them. She’s quite a jumper! Her only dislikes are baths, rain (an outdoor bath! ), and nail trims. 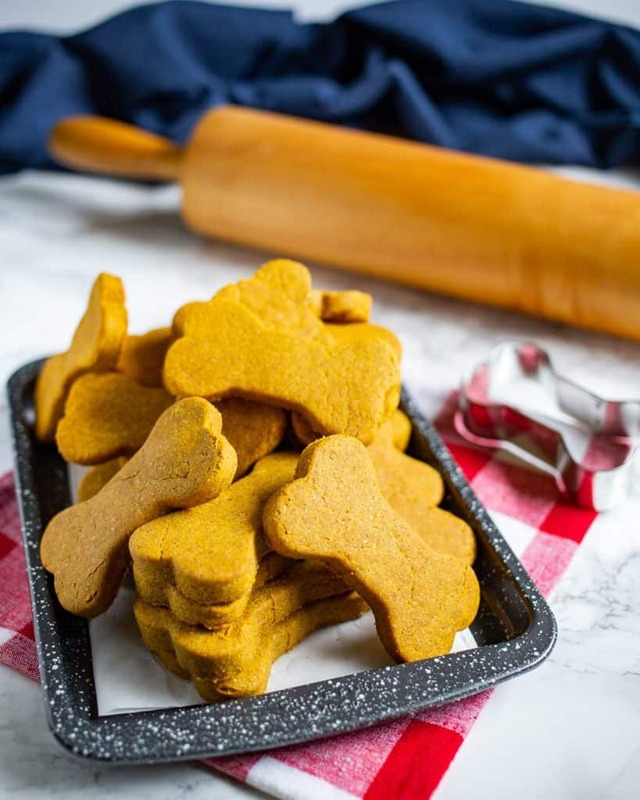 These treats are so easy and only have three wholesome ingredients, so I feel good about feeding them to Lily. 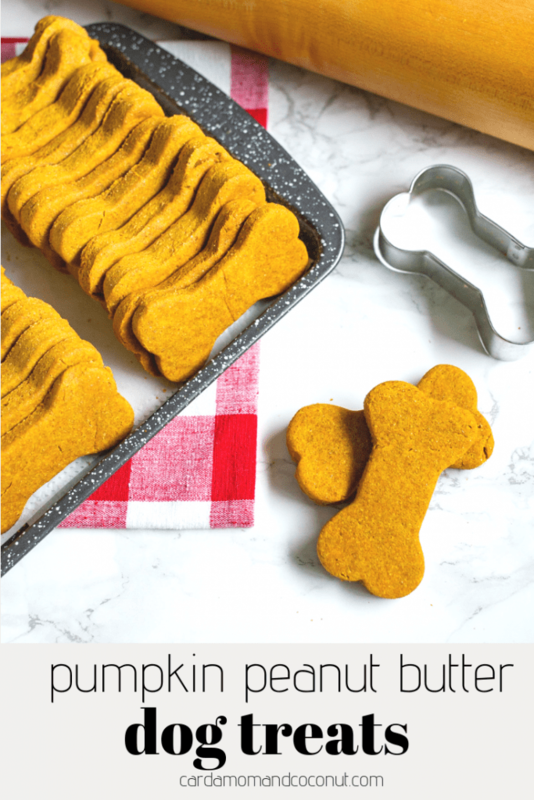 Start by mixing together pumpkin puree, peanut butter, and whole wheat flour together in a bowl. Roll out between two sheets of parchment paper (the mixture is a bit sticky, so the parchment paper minimizes the mess). Cut into squares using a knife, or any shape you want using a cookie cutter. Place on a nonstick or foil-lined baking sheet and bake for 20 to 35 minutes. 20 minutes will yield soft baked treats, 35 minutes gives you crunchier treats. 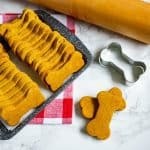 Let me know how your dog likes these! Add all ingredients to a large bowl and mix together. Place a sheet of parchment paper on your counter. Add the dough place another sheet of parchment paper on top. Using a rolling pin, roll until desired thickness. Mine were about 1/4 inch thick. Remove the top sheet of parchment paper, cut with a cookie cutter or knife and place the pieces on a nonstick or foil-lined baking sheet. 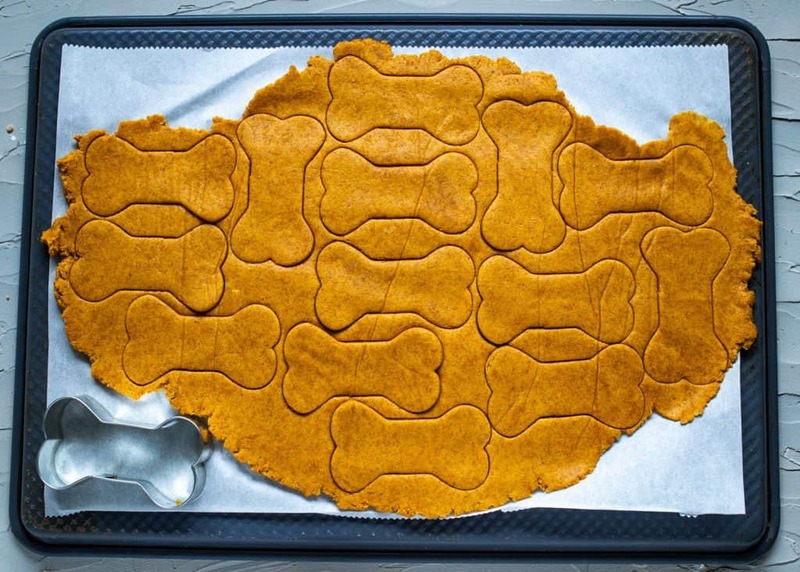 Bake for about 20 to 35 minutes depending on the thickness used and the desired crunchiness of the treats. 20 minutes will yield soft baked treats and 35 minutes will be more crunchy.